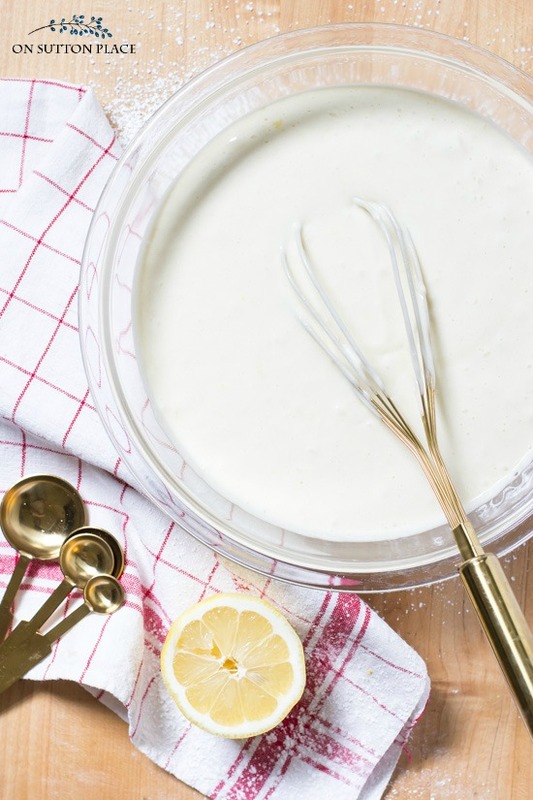 How to Make a Box Cake Mix Taste Homemade | 12 tricks to take a box cake mix to the next level. Cake mix recipes included! No matter how long you’ve followed this blog, even if it’s only been a little while, you know I like easy and quick. I don’t usually bother with projects that involve a lot of steps. This applies to recipes as well. My desserts use basic pantry ingredients and almost all of them are simple to make. One of my favorite ways to bake a cake is to take the semi-homemade approach. How to make a box cake mix taste homemade is easy and there are so many different ways. That’s what I’m sharing today, along with some easy cake mix recipes. 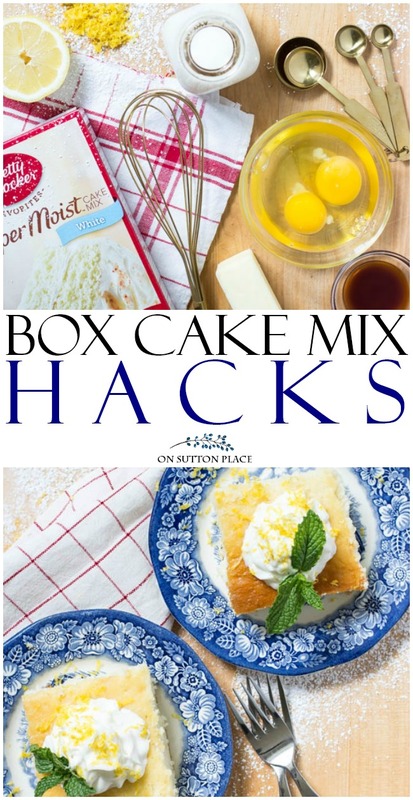 I put together twelve tips…ten box cake mix hacks and then two bonus tips that I had to throw in. Add an extra egg: Adding an extra egg will help hold the ingredients together. Some cakes have more air than others and the extra egg adds denseness…and therefore the cake is more moist. Substitute milk for the water: Using milk instead of water makes for a richer taste. It also thickens the batter just a bit which results in a moister cake. Add 1 teaspoon of vanilla: Vanilla is an ingredient that can be added to all baked goods with amazing results. My best tip is to buy good quality, pure vanilla extract…or even better, make your own. Just combine vanilla beans and vodka, let set for a few months and you will have the best vanilla ever! Substitute melted butter for the oil: Substituting butter for the oil works miracles and makes the cake taste like it was made from scratch. Make sure to double the amount. For example, if your cake mix calls for 1/3 cup oil, use 2/3 cups melted butter. Substitute applesauce for the oil: Substituting applesauce (equal amounts) for the oil will drastically cut down on the fat and calories. Although I wouldn’t consider cake a healthy food, using applesauce instead of oil or butter is a good way to make cake less of a splurge! Use one can of coconut milk as a substitute for ALL listed ingredients: To make a gluten-free/vegan cake, just use a gluten-free cake mix and substitute one 13.5 oz. can of coconut milk for all other ingredients. Bake according to package directions. Use one can of diet soda as a substitute for ALL listed ingredients: To make a very low calorie, low fat cake, all you do is combine any SUGAR FREE cake mix with one 12 oz. can of diet soda. Make sure to beat it on medium speed for the designated time…it’s usually two minutes. This will make a 9 x 13 sheet cake. Divided into ten pieces, each piece calculates out to 130 calories or about 4 Weight Watchers points. Add lemon zest: Lemon zest brightens the taste of just about anything. 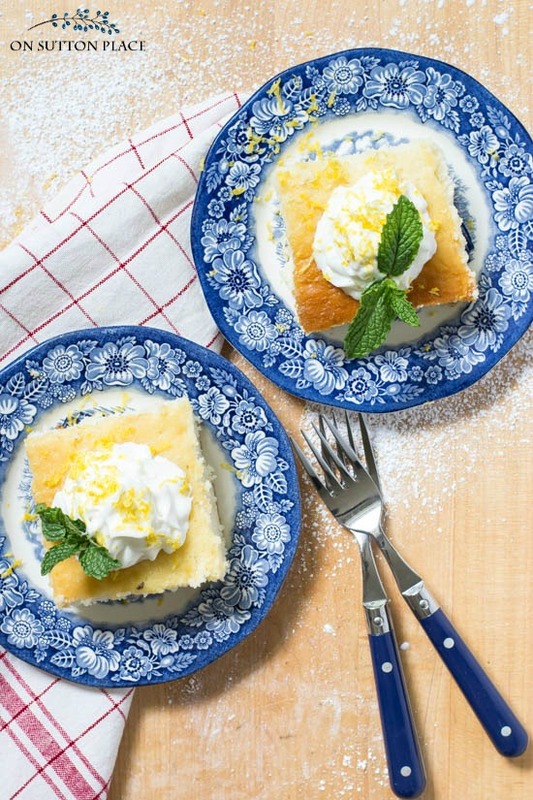 My favorite hack is to add a heaping tablespoon of lemon zest and a tablespoon of lemon juice to a white cake mix. (Pictured in this post.) I serve it topped with Cool Whip and extra lemon zest. Yum! Add a box of instant pudding: Adding a 3.4 oz box of instant pudding to any box cake mix will add extra moisture and give it a denser texture. Mix ingredients until well combined. Drop rounded teaspoons onto cookie sheet. Bake at 350 degrees for 10 – 12 minutes. Chocolate cake mix, butter, eggs, 1 cup chocolate chips: make 1 inch balls and roll in powdered sugar before baking. Yellow cake mix, butter, eggs, 1 teaspoon vanilla, 1 cup oven roasted nuts: walnuts, pecans or almonds. Lemon cake mix, butter, eggs, zest of one lemon. Drizzle with powdered sugar glaze after cookies cool. When you take your cake out of the oven, let it cool for about five minutes…then cover it loosely with a piece of wax paper. This will keep in the moisture and the cake will melt in your mouth! Mix a can of store bought frosting with half of an 8 oz. container of whipped topping. It will be light, fluffy and super easy to spread. 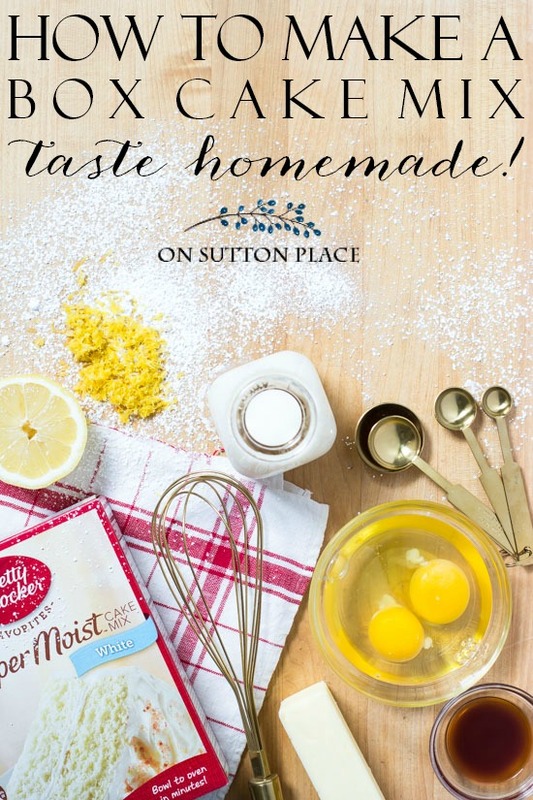 If you have any cake mix recipes of your own, please share in the comments! Way back in January, I talked about losing some weight and even shared a bran muffin recipe. Then my mom died and I was eating anything I wanted…mostly peanut butter sandwiches with a hefty side of potato chips! It all caught up with me and I finally decided to join Weight Watchers online. It’s very easy and I am finally losing those unwanted pounds. (No…I’m not getting paid to say that.) Anyway, one thing that has literally saved me is the two ingredient “can of pop” recipe mentioned above. Give it a try if you are dieting! Thank you for stopping by…I cannot tell you how much I appreciate it. I’m in a bit of a slump where pageviews are concerned so I don’t take your visit here for granted. I am grateful for every single one of you! Visit my Amazon.com shop to see all my favorite baking items! Thank you Ann for these box cake tips; and the cookie recipe. They all sound so simple and I’m sure will make the ‘ordinary’ taste ‘outta this world special’. I made the single serve brownie in a mug. It was just the right portion size to eat and not feel guilty. I have both milk and dark fans in our house, so we made everyone’s cup to their specifications. All four of us were fans. Thank you for the idea. I really enjoy your posts. Ann, I enjoyed today’s posts, as always, and am inspired to conquer the cabinets in the kitchen. Thank you for the example and the sources. We’ll all benefit so much from added organization. As always, I love the blog and your enthusiasm and sense of order and can-do spirit. Greetings Ann~ Love your writing style, decorating and recipes. Always look forward to seeing your email in my box! Sadden to read about your mom……..never easy and a hug for you here (YOU)……get it? the parens are my arms hugging you………. =-) Here’s a cool way to handle a cake and have done this several times………1) take crushed chocolate cookies or Oreos (with the cream) and add them to a chocolate cake mix following cake mix directiosn and bake. Delish!! 2) Add cherry Solo filling to a chocolate cake mix and it will taste like BlackForest cake! Follow directions as on box……..3) you all know there is a red velvet…….there’s blue velvet cake too and I’ve done BLACK! OMG what an awesome contrast to see black cake against white cream cheese frosting! Truly stunning…….. try it and ENJOY!! Just wanted to let you know that you are by far my favorite blogger. You are so real. I appreciate your honesty and all of your tips that help me make my life easier. Love Love Love your blog! I cannot count the ideas I have copied and modified from you! I host a small ladies group and will be doing the “slim cake” this month. So thankful for you and the special friendship we have! Love the make your cake homemade taste. Will definitely save this. Your blog is such a delight. After the kind of rush through all the info yours is there quiet and non rushed. I save you for the end. You say what you say in a gentle way. I want to read your recipes. I want the gardening hints. That picture I will save to print out. I appreciate you. And mom has been gone 5 years already and she is always on my mind. Ann I am so very sorry about your mom. I hope and pray sweet memories bring you peace and comfort. Your BLOG is so very inspiring and is my favorite of all that I read. I hope those page views skyrocket! Thank you for bringing a little pretty and inspiration to my day. Losing a mom is simply hard….my mom had Alzheimer’s for 10 years and was not functioning in any way…blessing yes….extremely difficult still…..and we all have to grieve in a way that works for US!! Kind thoughts your way. i am so sorry to hear that you recently lost your mother. I lost my mom in November to an extended battle with Parkinsons Disease. People say things like, ‘she’s better off now, she’s not suffering’, or ‘she would have never wanted to linger like that’, or ‘you knew it was coming and she knows how much you loved her’… Fact remains though, none of us are really ever ready for our moms to go. A good friend who lost his mom to a stroke was very candid and told me that losing our moms leaves a void that never will be filled. My thoughts are with you. . . One day at a time. You are so right JaLea. I became a different person on the day my mom died. I am adjusting and beginning to remember her as she was when she was healthy…and trying to focus on the good times we had. I agree though, nothing can fill that void. My thoughts are with you as well as my prayers. I’m a newbie to the blog and I think I have learned more life hacks in the month or so I’ve been reading Sutton Place then I have from blogs I have followed for years! This post in particular … I had no idea box cake mixes were so versatile …. cookies?? Soda vs other ingredients?!??? Genius! I’ve adding pudding mix and it works, but love the ideas here much better — have also added mayo and it gives it a fabulous moistness as well. I’ve never tried mayo but it makes perfect sense. Thank you so much for sharing! I wish you would share some info on the blue & white dinnerware you showed in this blogpost I love it. Hi Linda…the blue and white dishes are called Liberty Blue. The pattern is Staffordshire china and was made during the Bicentennial. It was originally given away to customers at a bank in Oregon. Later it was sold/given away in grocery stores as an incentive to buyers. Spend $50, get a place setting sort of thing. It can still be found on eBay, Etsy, and at antique malls. I collected my set over a period of about a year. I love it too! I am flying out to the kitchen to try your “diet soda” cake recipe. Oh, heck, I need a SF cake mix. Will have to go to the grocery. Thanks for sharing all these great recipes for using cake mixes! Sounds great. I love your blog! It is something I look forward to daily — I re-read 😊! Condolences regarding your mom, these are tough days I know. Thank you for sharing with us, good luck with WW, would love to hear more about the on line. Good self care! Thank you for all the tips ! I have made red velvet cupcakes with the mix and Diet Dr. Pepper, then made cream cheese frosting ( with light cream cheese) and they were great. I can’t wait to try some of your recipes. Good for you and good luck with WW…it is so hard to lose when you like to cook/bake/entertain…that is why I appreciated this post. Have a great weekend ! I just love all of the ideas you have given us for the cake mixes! I will definitely try them!! My lunches are just like you used to eat.. A peanut butter sandwich with a side of chips! The other day I even tried a flutter nutter, for the first time. IT was delicious. Not healthy, I know, but what a splurge! I’m not to, to much overweight, but I would like to eat healthier! Thank you so much for all of your posts and blogs, ideas and inspiration! I love it all! I rarely make cakes because our family has 2 diabetics, our son is a Type 1, insulin pump, the whole awful nightmare Type D. He calculates carbs/insulin so am wondering if you know the carb count in your sugar free version. Mom, who will be 90 this summer, loves cake but she developed Type 2 D as an adult so she is limited with sweets. However, I want to make a birthday party for her and have been wondering what to do about a cake. So thank you very much for this sugar free version! Thanks for the hacks. I’m definitely going to try the one with the diet pop! Isn’t it amazing how a person can transform a cake mix! Thank you for sharing your tips and tricks with us at TOHOT! Hi Ann. Thanks so much for your emails and blog posts. I’m so sorry about your mother’s death; it’s such a hard loss to bear. Any time I use a lemon I grate the peel or cut it into strips before cutting and juicing it. I store toe peel in the freezer and I always have fresh frozen lemon peel available for baking or espresso that doesn’t involve cutting into a lemon. I’ll definitely try these tips. I am also a WW and have reached goal. The program does work, so keep it up. Who knew? I’ve never heard of these tips! Will definitely try! I have experienced a lot of loss and am having trouble digging out emotionally. You are proving inspiration to push through the pain. It’s hard! Thanks for sharing your lovely blog. Thanks for sticking to the Quick and Easy! What fantastic ideas. Thanks Ann. I so appreciate all your ideas and your lovely blog. It always makes me smile. Every time you talk about your Mom, I think of my Mom and smile. Ann, you are a blessing to all of us. So sorry to hear about your mother. My Dad passed away in March of this year and I still have my mom. He was 90. I was his caretaker and my mom’s now. I love your blog. I have learned so many ways to keep myself busy with the creative things I love to do. Thank you again and please keep on…. I’m so sorry to hear about the loss of your mother. I will keep you in my prayers. I love every post you write. I hope you will continue. Your photography is beautiful and I feel I always gains something in reading. Your posts. Thanks for the tips Ann!! Just in time , too, since I’m making cupcakes for the 4th! Love your blog, and the many great ideas, thanks for sharing! I love your site, it’s not only pretty to view, but always full of good information. I am anxious to try these cake mix hacks. My grandchildren love cake! I just liked your Facebook page. You do such a fine job with your FB, I can see why you might see a slump in page views. Kind of a catch 22. I will keep continue to watch both, hope that helps. I love your style and content. I don’t want to see you go anywhere! Good morning Ann, losing your mom is so emotional, anything can happen. Bless you and for getting back on track. Simple desserts are wonderful and delightful! I have been at my mom’s for a month ( health scare) and going back home soon. The days have been very precious to me. Oh my gosh thank you for catching that! I forgot to add that the cake mix has to be gluten-free. Quite an oversight…so thanks again! I always read your emails, in fact, I look forward to them. It’s my favorite of all & I love your recipes. Thanks for your blog Ann! Love those tips – thank you! I am an avid baker but every once in awhile I’ll cheat and use a cake mix as a base because I just get too busy. This weekend is one of them, because in Canada we celebrate July 1st which is equivalent to your July 4th and I’m always asked to bring dessert and we have two barbecue’s this weekend so I will definitely be using your tips. P.S. I’ve done WW too and it does work!! Stay strong Ann! This is a busy time of year with kiddos out of school and families cramming in vacation time before school starts in the fall. I’m guilty of not commenting due to shear lack of time! Love your blog and I too have been trying to shed some pounds unsuccessfully (sad face). But still trying which is the key! Best wishes on your weight loss journey and you are valued out here!!! Thanks Ann great ideas! Have a wonderful 4th! I’m excited to try the can of diet soda addition, my husband loves cake, but doesn’t need the calories. Hopefully this will tickle his taste buds! Thanks! Seriously it has saved me. I use fat free Reddi Whip or Cool Whip Free. The Reddi Whip has 0 points! When I make a box cake I always add the extra egg and use milk…and I always lay a piece of wax paper over the pan after it comes out of the oven. The cookies are really good too! I love the lemon ones.